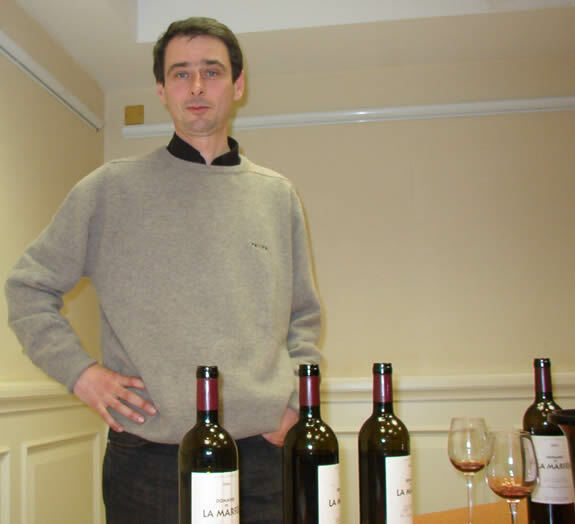 Domaine de la Marfée came into existence in 1997, when accountant Thierry Hasard (above) purchased 5 hectares near Montpellier at Murviel. Murviel translates as old wall, and there’s still a wall here dating back 2000 years to the Romans. Hasard waned to make great wine from the outset, and his choice of vineyard was influenced by the advice he had: he had five or six to choose from. He was more interested in the potential of the terroir than the actual state of the vineyards, so when he got hold of his plot he kept some old vine Grenache and Carignan and pulled out the bad varieties. Now the domaine is 9 hectares in size. His philosophy is simple: he wants to make wine with personality, respecting the soil. He chooses to eschew chemical products and just ploughs a bit (not deeply). ‘I want to respect and reinforce life’, he says. He also thinks that terroir is more important than the grape variety, a sentiment echoed by many of France’s leading growers. The wines are represented in the UK by Grand Cru Wines (www.grandcruwinesltd.net), and their prices are given in brackets.